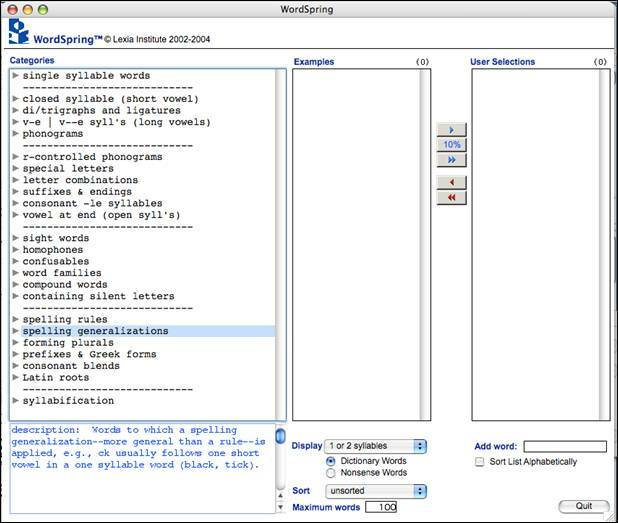 With WordSpring you can create word lists for spelling, decoding, fluency training, and vocabulary development. 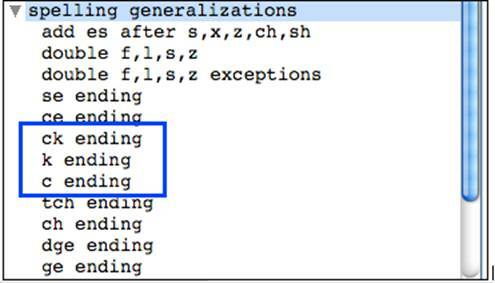 WordSpring provides lists for all the important spelling rules and generalizations. 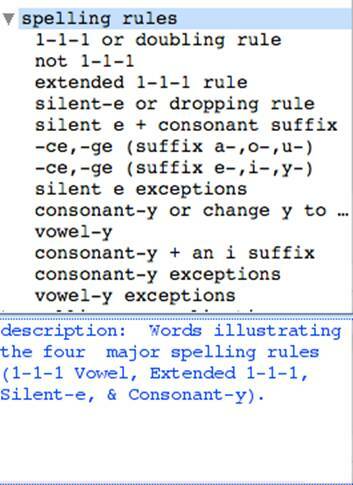 Here is an example of how teachers use WordSpring to create lists to help students choose the correct spelling for the sound \k\ at the end of a word. Scroll down and select spelling generalizations in the Categories window. 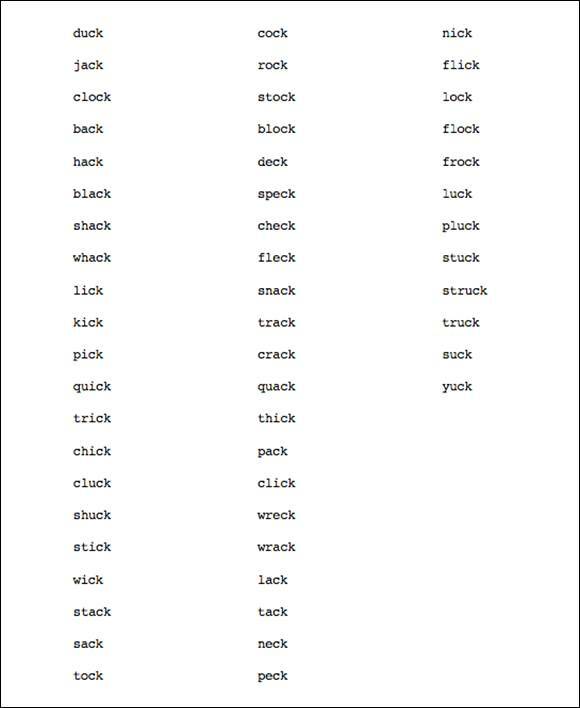 You will see the three ways for spelling the sound /k/ at the end of a word: ck, k, and c.
WordSpring provides lists for each of these endings. As you click on each ending, a definition appears in blue at the bottom of the Categories window. - ck usually comes directly after one short vowel in a one-syllable (base) word (trick, smock). Additionally note the tip stating that ck is also found in compound words (thumbtack, nutcracker). - k, and not ck, usually comes after one or more consonants (silk) or a phonogram (look, dark, shook) or letter combination (shrink). If you click on the ck ending, and choose the one-syllable option below, you will see a list of –ck words that you might use in your lesson. These words will appear in the Examples window. You can create your own list from these words. To do this, move all the words to the Selections window by clicking on the button with two blue arrows. You can remove words from that might be too challenging for your students by dragging them out of the Selections window. For example, you might choose to remove words that begin with sch and kn. Now print this list to dictate to your class for spelling or to give to students for study. If you want to give the list to students, you might print it in a larger font. If you want to use this word list for fluency training a few days later, you may print it using a larger font with the words arranged horizontally (as shown). Over several study sessions, create three lists by selecting one-syllable words ending with the /k/ sound or phoneme spelled with a k.
For the first list, include only those words that end in k after one or more consonants. Words on the second list have k after a phonogram. Words on the third list have k as part of a letter combination. It is easy to create mixed lists for decoding, fluency training, and spelling. Later, you can move on to creating lists for the /k/ ending using two-syllable, or three and more than three-syllable words. Any specific difficulties that your students are having can be addressed on the spot by creating individualized lists. For example, suppose you notice that some of your students are having difficulty reading words beginning with wr. To remedy the difficulty, look again at Categories and select di/trigraphs & ligatures. Find wr and read the surprising tip describing wr in the window at the bottom of the screen. A list of wr words is at the right. WordSpring provides lists for all the important spelling rules and spelling generalizations. 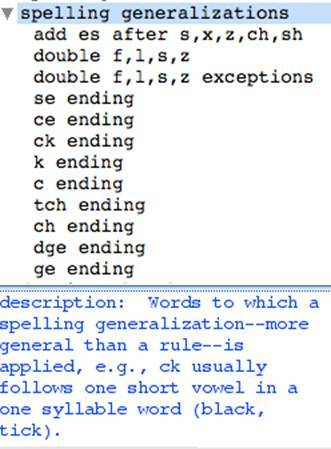 The rules and generalizations included in WordSpring are shown in the Categories window. With WordSpring you can easily create lists for all your spelling lessons.